The 10th edition of “The Florida Construction Lien Law, an Overview” by the firm’s Steven M. Siegfried and Nicholas D. Siegfried has now been published and become available. 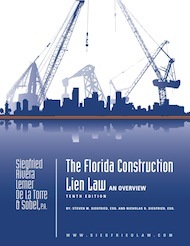 Originally published in 1986 to provide lienors in Florida with important information to comply with the state’s complicated lien statute, the book has become a valuable resource for all of the participants in the construction process, including lenders, owners, design professionals, contractors, subcontractors, suppliers and attorneys. It includes a complete copy of the Florida lien statute and all of the forms that are needed to comply with the lien law. The book is priced at $90, and orders can be placed via e-mail at info@siegfriedlaw.com or by calling us at 1-800-737-1390.